These days between Memorial Day and Independence Day are always special for me. It is the beginning of Summer, my most favorite time of year. I spend the long, cold nights of Winter yearning for this season and this special time. These days are special in another way. This time of year brings to my mind the great sacrifices that many men and women have made from the very first days of our Republic - from Lexington and Concord to the very present. As citizens of this country we need to be reminded that we have received a very special gift. We have been given a free nation, where freedoms and rights have been bestowed upon us to a degree that had never before been seen on the face of this earth. It is our duty, as citizens to not take these gifts lightly, to guard them with great vigilance; and to go about doing our civic duty with pride and reverance. This is a changing time in our Nation. Our flag and our country used to be regarded with pride and they held a special place in our hearts. We used to believe that America was an exceptional nation; put here by Divine Providence to be a beacon to the rest of the world - to be a shining example - to be the City on the Hill that everyone else could look to as the example to be followed. Somewhere, somehow, we've fallen into a habit of self-flagellation. We are constantly being bombarded by our own media, the media and governments of other countries, with the idea that somehow the United States IS the problem. We have fallen to self doubt and we stopped believing that this great Nation is the best, last hope for the world. I believe this habit is a disgrace; and I believe that it is a slap in the face to all those men and women who made the ultimate sacrifice. 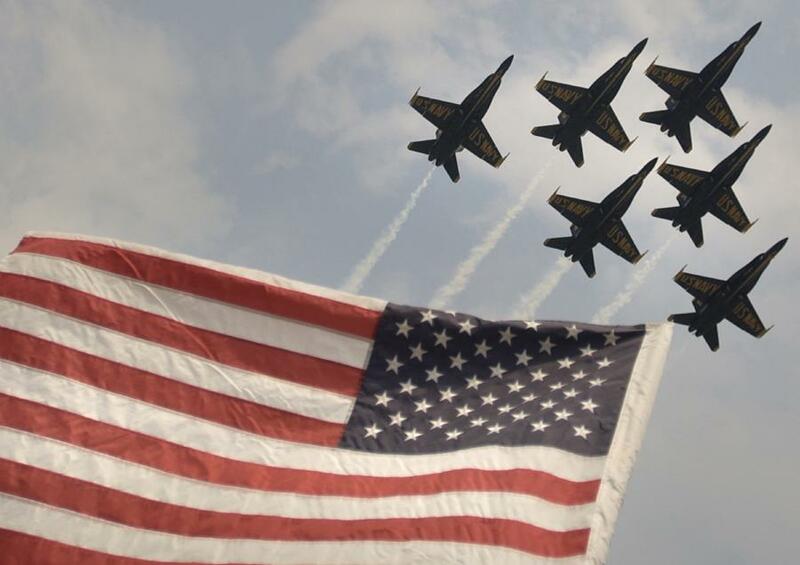 It is a dishonor to our men and women in the military today; who put their lives on the line every single day protecting our freedom and way of life. Honor their memories. Honor their service and lives. Honor your country. Do your civic duty and live your life every day, proud to be an American. Sunday night was the QRP-ARCI's Hoot Owl Sprint. This is a 4 hour CW Sprint which lasts from 8:00 PM until midnight, local time. I had a fun evening, operating as I was able. I didn't sit there for the entire four hours. In all, I made 40 QSOs, 34 with QRP-ARCI members and 6 non-members. I had 25 states/provinces and since I operated at 5 Watts I got a 7X power multiplier bonus. My final score was 31,850 points. I was one of only three New Jersey stations that I heard on the air. I wonder if I'll place well for New Jersey? This event brought my QSO total for 2006 to 799 QSOs for the year so far. 1KMPW without breaking a sweat. 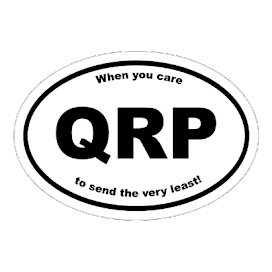 For QRPers, it's the Holy Grail. It's the pot of gold at the end of the rainbow, it's the end all and be all. It's the 1000 Miles Per Watt Award. I earned mine a few years ago and got the certificate, finally, last year for working the Kwajalein Islands with my K1. It ended up, at 5 Watts, being about 1477 miles per Watt. The certificate hangs proudly on the shack wall, in a more conspicuous and prominent place than my DXCC award. A lot of QRPers never really try for the award, thinking it's too hard. That's what I thought, too .... for a while. Tonight, I decided to try a little experiment. This weekend is the CQ WPX contest, which is sponsored by CQ Magazine. WPX stands for Worked All Prefixes. The idea is to see how many different callsign prefixes you can work in 48 hours. To me, a non-contester, it's just a big cacophony of 40 wpm + Morse on the bands for the entire weekend. But tonight, it presented an opportunity. I decided to see how many miles per Watt I could work in about a half hour's worth of casual contesting. I turned the K2 from its customary 5 Watt setting, down to 1 Watt out. I decided that I would try to work some DX on 20 Meters after the kids went to bed. This is what I worked, with no effort, really. One or two stations asked for repeats; but most got my transmission fine the first time. There's DX to be had in them thar hills when the DX is hungry for contest points! So without breaking a sweat, this is what I worked. The distance computations are approximate, based on what QRZ and Win-EQF computed. I guess the actual results could vary a couple hundred miles, either way. DK3GI - Germany - 3987 Miles per Watt. Of course, I realize that this is a testament to the fine DX stations who probably have superb antenna arrays; and are top-notch in every conceivable notion. My 1 Watt and G5RV are in no way the same class as these guys. I'm not nearly stupid enough not to realize that. Also, this is not conversational CW. You know going into the contest what the exchange is; so CW was being exchanged between my station and the DX at about 25 wpm. If these were regular ragchews; I'm sure I would have been asked for repeats and fills. But ... it is interesting to see what 1 Watt can do. Maybe next year, I turn it down to 500 mW. They also have a cool pin of a straight key with the words,"know code" underneath the key in Morse Code. A special tip o' the cap and a very big thank you to Jeff Davis, KE9V the author of the blog "Long Delayed Echoes". Jeff has made the "pain" of not being able to attend Hamvention and FDIM just a little bit more bearable. His excellent photos and his podcast "play by play" help one from feeling totally left out. Today, the weather here in Central NJ is just like what I used to during Hamvention. It's sunny one minute; and pouring rain the next. Put out a few folding tables with used computer parts on them and I'll feel like I'm really there! I went out to the car at lunchtime (one of the "nicer" weather moments of the day) and got on 20 Meters. No contacts made today. I heard a few signals; but it seemed everyone was already engaged in a QSO. I answered the one lone CQ that I heard coming from a VA3 station on the FISTS frequency. Each time, my answer was another CQ; so I guess I wasn't being heard. After lunch, I got an e-mail from my friend Brian KB9BVN in Indiana. He heard me calling CQ; but I was only a 229 - ESP levels. It's odd how one day conditions can be so good and the next day you find yourself in the middle of the skunk farm! Within an hour of being back inside after lunch, the sky turned dark gray, there was thunder, lightning and hail. I'm glad I got the antenna down and everything stowed away in time! as well as maybe a few new prospectiveones? (Hint, hint!). It's always neat when you come home from work to find something neat that has arrived in the mail. Today there were two envelopes included with the bills and the junk mail. The first was a QSL card from Tony Morgan W7GO from Las Vegas, NV. I QSOed with Tony just recently and actually mailed him my card today! This one is special, as this confirms state number 49 in my quest to re-do WAS, this time all CW and QRP. The only one that's left is Alaska. Not bad for the bottom of the sunspot cycle, eh? The other envelope was for the W2 QSL Card Bureau. Included were cards from HI8RV, Chikin in the Dominican Republic; and one from VY1JA, Jay in the Yukon territory. That was a QRP contact , too. There were also cards from the Turks and Caicos Islands and one from Martti Lane as EA8BH on the Canary Islands. The most "special" card, however, was from Luis CU2IJ in the Azores. This was a 2 way QRP QSO that we had back in April of 2004; and it was the first QSO that I had with my homebrewed Buddipole. I was sitting at the patio table in the backyard testing the antenna out, when I heard Luis calling CQ. I answered him; and for whatever reason, mistakenly thought he was a Cuban station. When I corrected myself and realized where he was; I was floored! 5 Watts from my K1 to a Buddipole that I made myself had spanned the entire Atlantic Ocean! Wow! It's things like this that keep Amateur Radio new, fresh and exciting for me. As some on this reflector know, I was with the FCC in the San Francisco office for 28 years, retiring as the District Director (then called the Engineer-in-Charge) almost 12 years ago. In the early 1970s I was, among many things, the code examiner for both amateur and commercial applicants. One day an old-timer came in, related that he had been a coast station operator at the RCA Coast Station KPH, and wanted to upgrade his Second Class Radiotelegraph License to First Class before he retired. To copy the 25 WPM plain text, he brought his own "mill" as was permitted. He sat down, asked if he could smoke (in those days it was OK in offices), put the paper in the "mill" and said "OK, start the tape". The venerable Boheme paper-tape reader started pounding out at 25 WPM. He took a cigarette out of his pocket, put it in his mouth, took a pack of matches from another pocket, lit the cigarette, dropped the matches on the floor, picked them up, and started typing. He pounded away and by the time the tape was finished had almost caught up. He took the paper from the mill, handed it to me, and said "Didn't think I could do it, sonny???" 73 de K2ASP - Phil Kane"
Thanks, Phil - that memory is priceless !! Rainy and 54 degrees here today (feels more like 43!). Wonderful for the grass, flowers and tomatoes that I've planted; but not so great for outdoor QRPing during lunch. Looks like the rest of the week isn't going to be so great, either, as forecasted by The Weather Channel. Hopefully, they're wrong and it will dry up; or at the very least get warmer. I don't mind the possibility of getting a little wet; as long as it's warm. Today was public service day. A few of us Hams in town helped out at the County Wide Track Meet which was held in South Plainfield, at the high school athletic field. Our responsibilities were mainly involved with helping all the out-of-town visitors park. We had to direct parking so that it would minimize the impact on local side streets. There have been instances in years past, where inconsiderate parkers have actually blocked people in their own driveways! My job was less "glamorous". I drew the short straw and was directed to a nearby elementary school. This was where the school busses that transported the visiting athletes parked. My job was to make sure no spectators parked and to get each bus driver's cell phone number. I would be radioed when a certain team was ready to be picked up; and I would then inform the respective bus driver that it was time for him to go over to the athletic field and make his pick-up. BORING! Mind numbingly boring! I was staring at the prospect of standing there for almost four hours, looking at school busses and not doing much of anything else. The only other highlight was when some potential spectator would abuse me for not letting them park in the lot. For a volunteer thing, the jibes I was getting were not so pleasant. Ham radio to the rescue! Since I drove over to the elementary school, I had the K1 with me. 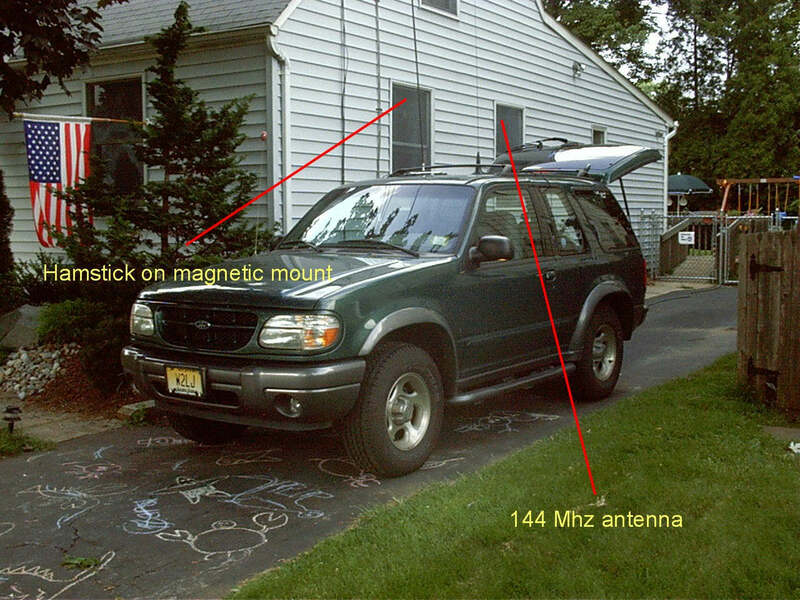 I put the station together on the front seat and put the 20 Meter Hamstick on top of the Explorer and went to town. I only had a copule of QSOs; but it was enough to make a long four hour prospect go rather quickly. The public service work was light and easy. Amateur radio made it fun. 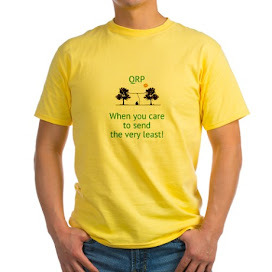 All I'm seeing on the e-mail reflectors for QRP-L and Flying Pigs and Elecraft are reminders that next weekend is Dayton. The lucky ones don't need to be reminded; and those of us not fortunate enough to be going don't WANT to be reminded. To those of you fortunate enough to be going - I wish you all a happy and safe journey there and back home. I just got in the mood to sit down for a bit tonight; and fill out some QSL cards for my lunchtime QSOs that I have been reeling in lately. I had five commemorative Edison QSL cards left; and decided to print up some more. No color ink in the inkjet! Arrgggghhhhhhh! Don't you hate when that happens? Looks like a trip to Target is going to happen sometime this weekend. The heavy rain predicted for today moved out early. The day is partly; but mostly sunny and the temperature here is 69 delightful degrees. Half a roast beef sub and a bottle of Pepsi were my lunchtime companions, along with Jon W8TY. I called CQ on 14.047 MHZ (more about that later) and Jon answered. He's visiting Norman, Oklahoma getting in some training as part of his job with the United States Postal Service. He was working me from his hotel while he was on his lunch break! What a coincidence! His 15 Watts to a 44 foot wire tossed out his window sent a very robust 579 signal my way. There's nothing odd about that; so why my title for this post? What happened prior to my QSO with Jon caused a raised eyebrow on my part. I originally dialed up 14.048 MHz, the SKCC frequency; and had fully intended to start out there. I listened for a little bit and heard nothing; so I put out a "QRL? de W2LJ". I went back to my sub sandwich for another bite; waited for a bit more than 10 seconds and put out a second "QRL?". Hearing nothing after about 20 seconds, I put out my first CQ. When I finished, my ears were assaulted by an ear-splittingly loud signal from a 3 station. He was in QSO with someone (who I obviously couldn't hear) and was complaining that he had a rough copy because "someone was calling CQ on top of you". Now, I was taught, many a year ago, that when you are in the midst of a CW conversation and someone sends a "QRL? ", that you either send a "C" or a "YES" or a "PSE QSY". This is part and parcel of CW operating and the process of finding an open frequency - no big deal. The 3 station was deafeningly loud - he HAD to have heard my query, which I had sent twice. Why did I not receive a "QRL" or a "C" or a "PSE QSY" or a "YES"? I'd prefer not to believe that a 3 station with a 1X2 callsign (Extra Class) wouldn't know proper CW operating protocol. And I can't believe that the QSB was that bad that he didn't hear me. If I was loud enough for him to hear my CQ; then I was loud enough for my "QRL?". Very strange indeed. Moral of the story? Better to learn the proper protocol and use it; than not and just complain. 1 (sandwich) + 5 (Watts) = Fun! Had good success at lunchtime today! It was partly cloudy almost to the point of being overcast. More clouds than not. The temperature was about 68 degrees and it was breezy. But the waters were stocked well today; as I continue to use fishing analogies. I got out to the car a little late; as I had to handle a few phone calls as I was leaving for lunch and the parking lot. I got set up at 17:07 UTC and started calling "CQ" on the SKCC frequencies on 20 Meters. My first effort was greeted by the dulcet tones of Don W4BWS, from Dothan, Alabama. Dothan, by the way is the QTH of Dave Ingram K4TWJ who is the prolific writer for CQ Magazine. Don gave me a 569 and we had a quick exchange of the standard RST, QTH and names. Don had to hurry as thunderstorms were rolling in near him and he was experiencing lightning. It's definitely not a good thing to be hooked up to a wire antenna that's high in the air when there's lightning around! My second QSO was with Edwin, KD5ZLB out of Shreveport, LA. Again, we exchanged SKCC numbers; but this was a more relaxed QSO. I could have carried on with Edwin for a much longer time. The ingredients for a good ragchew were all there save one - time! It was getting close to the end of my break and I still had to pack up the station and do my logging before making it back inside. Tomorrow, it may or may not rain. If the rain doesn't start until evening; then I'll be out there again tomorrow. 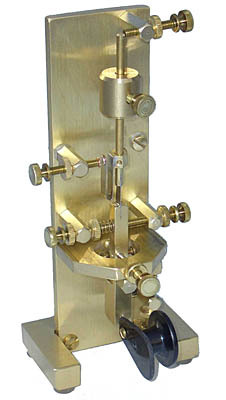 In yesterday's mail I received my Hendrick's Kits PCB Vise. This is super cool little vise designed to hold printed circuit boards during construction and repair. It stands maybe 3 or 4 inches high off your building/repair bench. 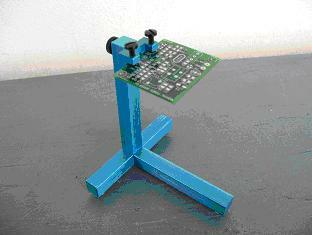 Ideally, it is meant for smaller circuit boards - I would think maybe a board 4'X6" max or maybe a skosh bigger. 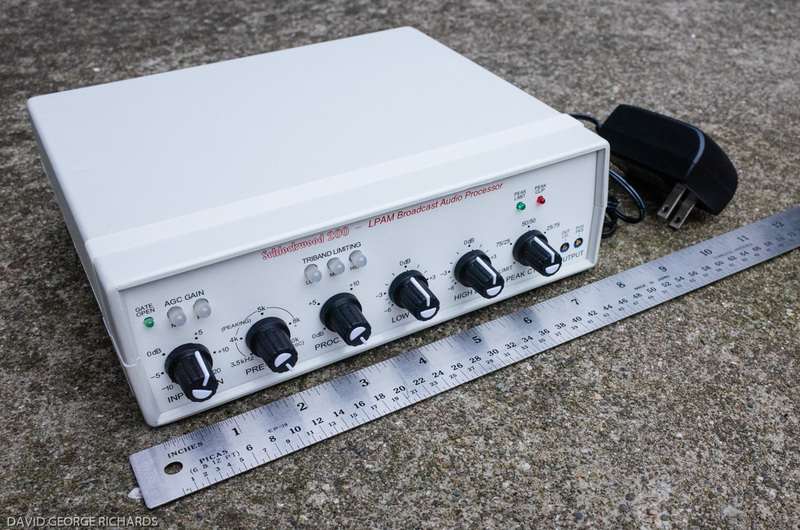 For circuit boards larger than that, two of these little puppies would be ideal. For twenty bucks, this vise is a steal! It comes disassembled in a package small enough to receive in the mail. I put mine together in about two minutes, tops. There's only one screw and you definitely do not need to be a rocket scientist to figure out how to put it together. It's well made and is definitely the answer that I've been looking for for holding PCBs during construction. My Panavise clone is way too bulky, heavy and ungainly. Thanks Doug, for finding a need and filling it! You can order yours by going to the URL above; or if you're lucky enough, Doug will have a goodly supply of these at Dayton. Dayton!!!!!! How I miss going to Dayton! The last time I was fortunate enough to go to Hamvention was ten years ago; back in 1996. That was the last year that Hamvention was held in April; and the year before the very first FDIM. FDIM, for the unitiated, stands for Four Days In May. It's the biggest get together of QRPers in the nation; and that it coincides with Hamvention is by design. I've never had the opportunity to go to FDIM; and that's a burning desire that I have. I know exactly where it's held. When I was making yearly treks to Hamvention; we stayed at the same hotels in Fairborn when the AMSAT folks used to reserve those rooms. I would love the chance to finally meet, face to face, a lot of guys that I have been fortunate to become friends with over the air and through the Internet. There's nothing quite like the camaraderie that the QRP folks enjoy. 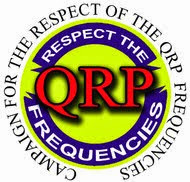 Over the years, I've been involved with FISTS, AMSAT and other groups; but the QRP community is unique; and I've never seen anything to equal it.FISTS comes in as a close second; but QRPers are just a notch above that. We talk on the air, we exchange ideas, laughs, jokes and barbs over the Internet. The feeling of belonging that you develop with these guys, many of whom you'll never meet in person, is just an amazing phenomena! To be able to immerse myself in that environment, for four days in May would be the ultimate. Attending Hamvention would be the icing on the cake. The following appeared today on the SolidCopyCW e-mail reflector. It was posted by Art, K4IRS. I liked it so much that I'm sharing it here! share with the group. If I did so already, my apologies. worked moderately hard to get as many more bands/modes as possible. the foray and earn another band/country for the Challenge. and the 756 Pro series can do it as well. my call in CW, around 15 wpm and mentally cross my fingers. "K4IRS QSL QRZ up 3" SUCCESS! couple of months later, I had the QSL! Great job, Art & thanks for sharing! It was a busy weekend - not much time for radio. I took Friday and today off from work. I spent all day Friday and part of yesterday, as well as most of today, spreading out 2 yards of topsoil in various areas of the backyard. Seems my dog has a penchant for moat building; at least that's what the back and right sides of my backyard looked like! I filled in the trenches with new topsoil and planted new grass seed. In addition, I tilled the garden patch and got it ready for planting; including putting up a "dog-proof" fence. Oh, I also mowed the lawns yesterday. This all didn't leave much time for radio. I got a QSO in on Friday night; and on Saturday night I handed out a few QSOs in the New England QSO Party. Then I made a couple of contacts on 30 Meters using the Butternut vertical. I get much better signals reports on 30 Meters when I use the Butternut. The G5RV just doesn't play well on 30; and that's a complaint I've heard from other Hams. Another good reason to get up an EDZ later this Spring, if I can! This afternoon, after all the chores were said and done, I commenced to get in my "QSO a Day" for May 8th. I still haven't broken the string since January 1, 2005. I'd really like to see how long I can keep it going. Today, I worked Vlad UT7IF in the Ukraine on 20 Meters. I used the G5RV on this one. He was 599 here in NJ; and he gave me a 569. Not bad, and it got the job done. I'll make my QSO for May 9, tonight after the UTC date changes over at 8:00 PM local time. I'll have to make it a quick one though, as "24" comes on at 9:00 PM. Gotta see how Jack Bauer get the incriminating tape of the President's actions out of the hands of the bad guys! I am so hooked on that show! It's about the only thing I watch on TV besides Mets baseball and "Monk" when they decide to show something other than a re-run! Another beauty of a day here in Central New Jersey, sunny and 80 degrees. I went outside to the car and set up the K1. I called CQ on both the SKCC and FISTS frequencies for a half an hour. Fish weren't biting today. In fact, tuning up and down the band; I didn't hear many signals out there. Thursdays must be busy days for folks. I'll get 'em next time! There have been a few bugs and keys on eBay over the past few months; that I have put bids on and tried to win. Several times, I have been outbidded in the very last few seconds by someone whose eBay ID is macflick. Now I have nothing against someone who outbids me and wins an auction. But if you look at macflick's winnings over the past few months, it is obvious that he/she is a key hog. Not only does this person seem to bid on everything Morse Code related; but this person also bids and wins on multiple amounts of the same types of items. As I've posted before, the 10th Anniversary Spartan Sprint was held Monday night. I used my K2, an Emtech ZM-2 antenna tuner, a Whiterook MK-33 paddle and an even smaller and lighter SLA battery that my friend W2WK gave me. All in all, my station weight was under 5 pounds. I apologize for the columns not being even! Anyway, not too shabby! 49 QSOs with 20 different states/provinces worked. But, I'm just a goldfish swimming in a sea of world class QRP ops who are like graceful and speedy dolphins. I doubt that I'll finish among the top twenty. But I had a good time and in the end, that's all that counts. I'm honored to have been invited to be one of the stations asked to get a special event callsign! Today's my birthday; and unfortunately, to say that it has been a trying day at work is an understatement, to say the least. It's been a real bear of a day; and I think the bear is winning! A QRP session at lunchtime was just what the doctor ordered; and today it was like a soothing tonic. I put out a CQ after I got everything set up; and I immediately got a call from Tony, W7GO. Tony is located in Las Vegas, NV. Nevada !!!!!!!! One of the last two states I need to complete Worked All States (QRP/CW). Wow! That was so cool! Tony was using his K2 at 5 Watts and informed me that I was his first New Jersey QRP contact. We helped each other; and I guess that's what Ham Radio is all about, after all. Right after my QSO with Tony, I was called by Tom W4WXA in Warner Robins, GA. I've worked Tom before on 80 Meters; but Tom is trying to get his 20 Meter endorsement for his SKCC Century Award, so we had a short one. Tom had a great signal; but the path between GA and NJ was fraught with QSB. Tom's signal was roller-coastering between 599 + to about 449; but we "got 'er done". Tom and Tony - a million thanks! You both helped to make a pretty crummy day a whole lot better! It's overcast and about 66 degrees here today. I went out and tried to work my friend, Brian KB9BVN on 20 Meters; but no joy. I slid on down to the FISTS frequency of 14.058 MHz and had two contacts. Seems I had a pipeline into Washington state. I worked Glenn W9FFU/7 and then Phil W7PFZ. Phil had a killer signal into New Jersey, 589 to 599. I've had the pleasure to work Phil before; but always from home. Now I can send him one of my Edison QSL cards. All in all, a good lunchtime QRP session. Just a thought. I guess my success in last night's Spartan Sprint means my emergency feedline repairs are okay ........... for now! As I mentioned in a post yesterday, last night was the 10th Anniversary Sprint for the Adventure Radio Society. Thirty members requested and received special event 1X1 callsigns; I was W2S for the night. And yes, I did screw up at times, ALMOST sending W2LJ !!! But from the activity on the bands; to comments already posted to the QRP-L e-mail reflector, a good time was had by all. Propagation conditions must have been exceptional last night; as I have not heard so much activity in an ARS Spartan Sprint in months! Maybe it was a case of our group creating our own propagation by heating up the ionosphere with our RF; but something was clearly working last night. I got a late start by a few minutes, as I had to watch the end of an inning of the Mets game; but in just under two hours, I completed 49 QSOs. I'm not a big time contester; so that may appear to be a pretty wimpy tally by most. For me that's pretty darn good. I kept switching between the HF9V and the G5RV all night long. The K2's mojo must have been working too. I guess the farthest DX I worked was Doc KØEVZ in New Mexico on 40 Meters and Randy K7TQ in Idaho. Both of those guys are superb ops; it was no surprise that they both had exceptional signals; and good fists to boot! I'll be posting my score to the ARS Spartan Sprint Autolog sometime tonight. John Sielke w2AGN, a QRP and CW friend from South New Jersey announced on the Brasspounders e-mail reflector that he had acquired this vertical bug from Tom, K4VIZ. I have one of Tom's mini paddles that I got last summer. It's well made and light enough for portable use, while at the same time is very sturdy. Both John and I are very satisfied with Tom's products. His workmanship is very, very good and his products hold up very well. I am definitely a satisfied customer! I would love to get my paws on one of these vertical bugs. As a recent convert to semi-automatic CW keys; this one looks like it would be a real treat to own. Of course, the only thing that prevents me from getting one is a small tiny detail .......... money! From there you can go to see details on the mini CW paddle and Tom's really neat 90 degree bug. That one looks like a keeper, too! makes W2LJ not happy! It was a nice day today; sunny and in the high 60s. I would have liked to fire up the K1 at lunchtime. Unfortunately, I had to go to the local nursery/landscape shop and order 2 yards of topsoil. There is much needed yardwork to do this weekend, filling in trenches in the backyard that my dog has been digging all winter long, as well as planting new grass seed in bare spots and covering the seed with topsoil. But I am excited about tonight. It's the first Monday of the month; so tonight is the monthly Spartan Sprint; sponsored by the Adventure Radio Society. This evening marks their 10th anniversary; so in honor of this, some of us were invited to apply for special event callsigns to be used in the Sprint tonight. I applied for and received W2S. So for just tonight, I will be signing as W2S instead of W2LJ. In fact Tom, K3TW the assistant contest manager managed to find applicants for all KXS, NXS and WXS callsigns for all 10 callsign districts! There will be 30 ARS members working the Sprint tonight with special 1X1 callsigns.